Sikkim is a small state in East India in the Himalayan foothills bordering Tibet (in the north), Nepal (to the west), and Bhutan (to the east). West Bengal borders in the south. The name has been coined from the words “Su him”, which mean “beautiful home”, reflecting the beauty of its snow-covered mountains and lush green valleys. Nearly 40% of Sikkim’s land area is forested. It is renowned for wide rhododendron woods with 450 different kinds of orchids. The orchids blossom from March to May. This beautiful little state has everything for you to do from listening to live music and chilling in one of the cafes in its capital city of Gangtok to trekking up mountains and adventure sports. You can immerse yourself in a spiritual clean in one of the hot water springs or go to a monastery to find you peace. You can walk amidst flowery spring, snowy winter or dance in the rainy monsoon. 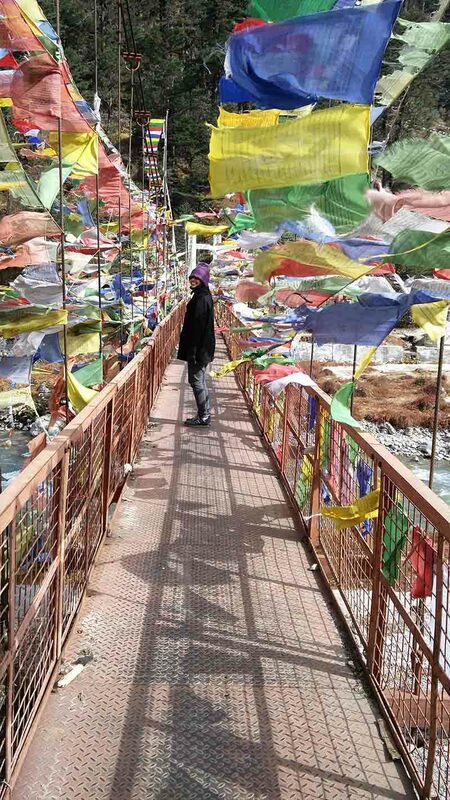 Sikkim has it all with the peace you don’t find in most other states of the country. 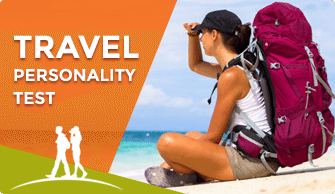 There are many adventure activities possible to do in Sikkim. Tourists can go for trekking, rafting, and kayaking, mountain biking, mountaineering and yak safaris. The capital city is a must visit when in Sikkim. From cafes serving hot coffee to live music and beer, you have those at MG Marg, from hot steaming momos to watching a football match you can get those at Paljor Stadium from monks at monasteries to sisters in churches, you have it all. The city can cater to the hip, the oldies, the youngsters, the peace-loving yoga do-ers. Whichever category you fall into, you will find something to do here. A visit to Yumthang Valleys it truly a colorful affair! 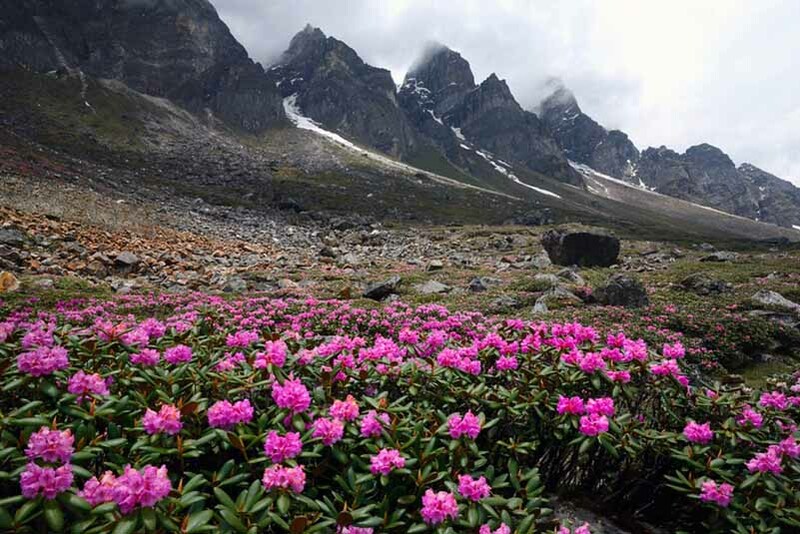 Located at an elevation of 3,500m, this scenic valley is the home to several exotic, rare and wildflowers. Best time would be post-March and during April where you get the flowers blooming and the picturesque snowcapped Himalayan background. With the breathtaking Himalayan peaks as its backdrop, this gigantic, 41m-tall Buddha statue contains holy relics from 11 countries. A spiral interior gallery showcases scenes from Buddha’s life in two very different but colorfully intricate styles. It is a beautiful drive to get here form Gangtok, especially in the monsoons. This institute is the most prominent place of research on Tibetan language and culture. It also has a library and a museum where some of the most historically valuable documents are preserved. Apart from that, the Namgyal Institute of Tibetology is also known for its traditional architecture. Located 24 km from Gangtok in East Sikkim the main seat of the Karma Kagyu school of Tibetan Buddhism in Sikkim. Originally built by the 9th Karmapa Wangchuk Dorje in 1740, but fell into disrepair. The current structure dates from 1959. If you love forgotten, naively painted temples, little Resum Gompa is likely to be one of the highlights of your monastic wanderings in Sikkim. Adding to the fun is the lack of any access road, forcing you to walk around 20 minutes through the forest, encountering occasional collapsing stupas and mani walls with sacred inscriptions. Architecture and religious importance are two of the best parts of the Phodong Monastery. 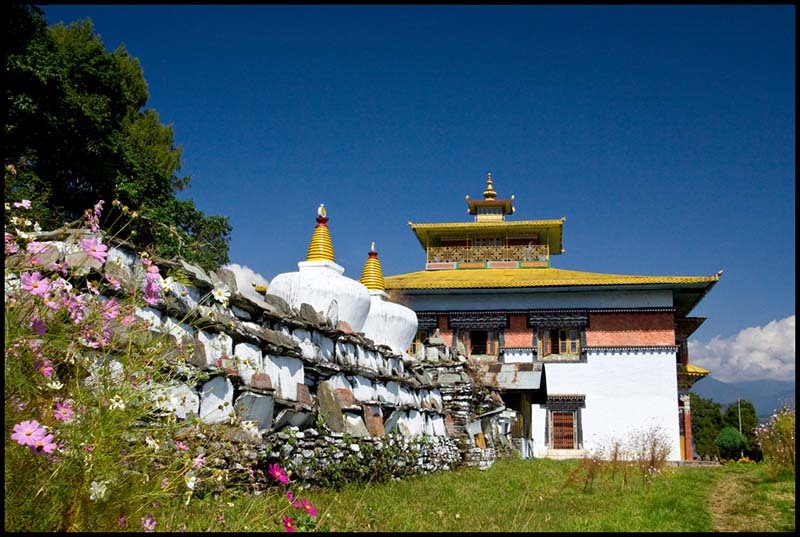 This religious destination is one of the top most important monasteries in the entire Sikkim. The Phodong Monastery was built almost 300 years ago, but over time it has been rebuilt again and again to survive the taste of time. The legend says the Do-Drul Chorten was built by a lama in 1946 to drive away the evil spirits that roamed in the area before. 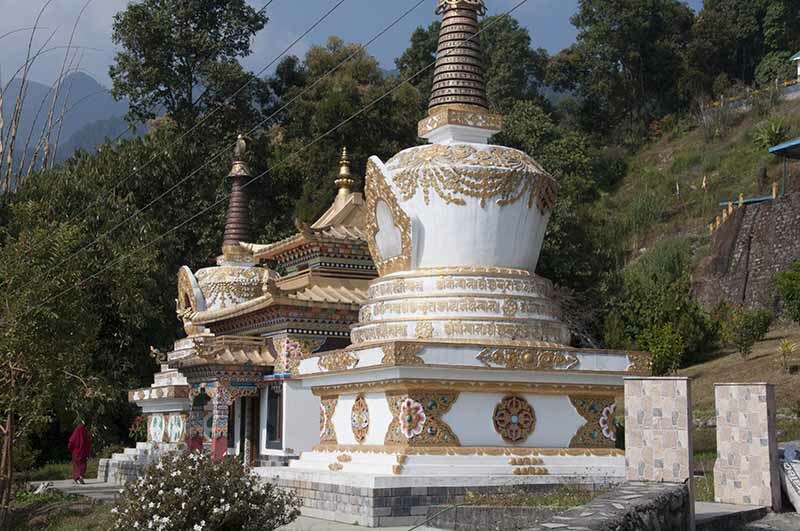 It’s located on a mound and the climb is rather steep, but you should consider taking that challenge because the Do-Drul Chorten is surely an important place to be in Sikkim. 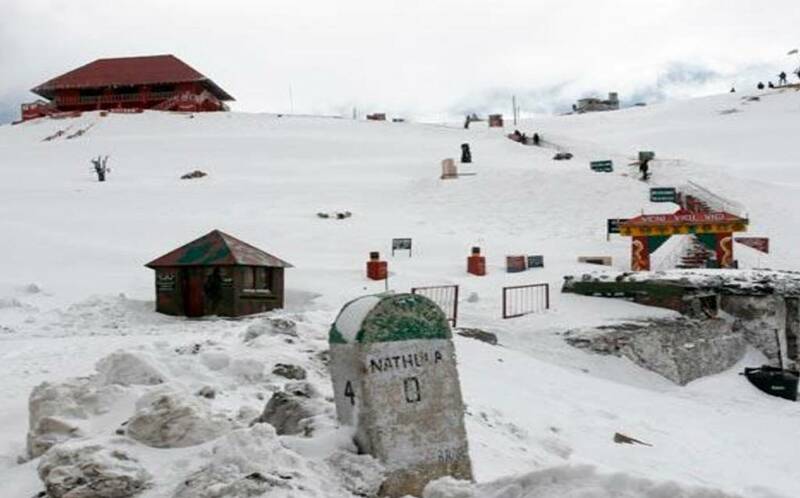 The Nathu La pass lies on the Indo-Chinese border and is only open for Indian tourists. People who wish to visit Nathu la should get special permission one day in advance. Closed on Monday & Tuesday. It closes in the winter and opens in May. The Goecha La Trek is one of those things to do in Sikkim that will surely stay in your memory forever. 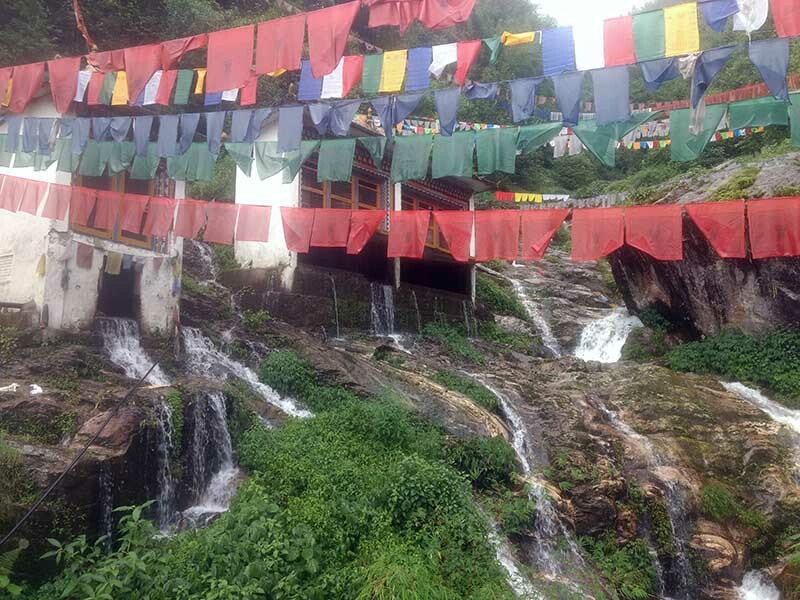 The Goecha La Trek takes 10 days to be completed and it’s only moderately challenging. October to November is the best time. The lake is also known as the Changu Lake and it’s made of glacier water. You can hire a car from Gangtok to reach the Tsomgo Lake, located at 12310 feet. The lake is 35 km from the city and an early start will make your visit even more spectacular. The lake is surrounded by mountains and during the winter season, the surrounding areas stay covered in snow. The beauty of the entire scene is breathtaking. 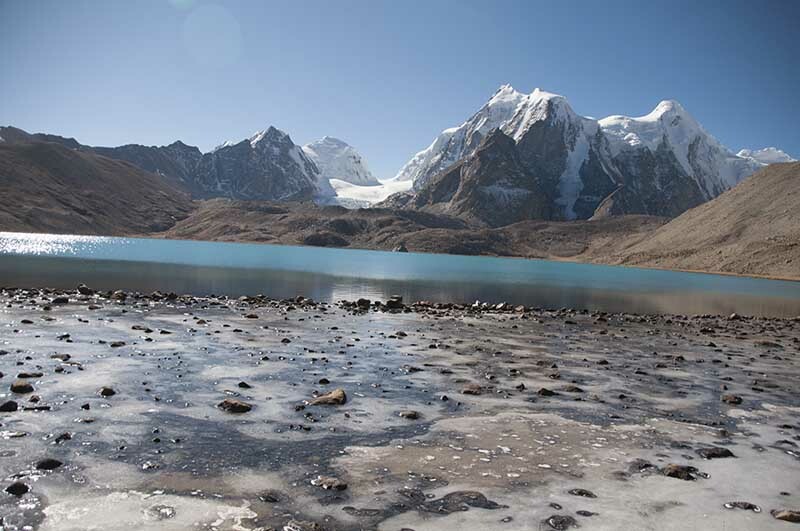 Gurudongmar lake is at an altitude of 5,150 meters. The lake is pristine and is considered sacred. The lake is frozen during in the winter, except for a small part which is considered to be touched by Guru Padmasambhava. For day trip visitors a night stay at Lachen is advised to allow altitude acclimatization. It is recommended that visitors do not run or speak loudly, rather sit by the lake enjoying its beauty and the surrounding mountains. Tourists are generally asked to leave the place by 13:00-14:00, after which the wind speeds pick up and are enough to carry small stones. Foreigners aren’t allowed here due to security concerns. Eight kilometers from Nathu la pass is the original Harbhajan Singh Baba Temple from which the Indo-Bhutan border is approximately 6 km and the India-China border is around 5 km. 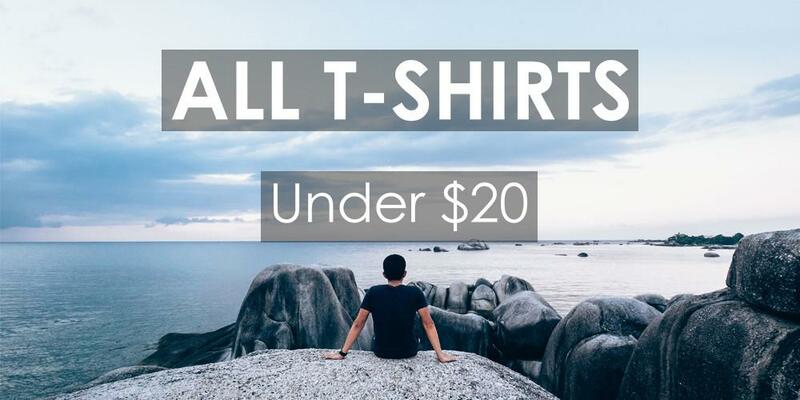 A must visit place for all those who like to explore places! Chungthang is in the northern part of Sikkim. It is located at the confluence of Lachen and Lachung Chu and is the starting point of the river Teesta. It is believed that Chungthang is blessed by a guru Rimpoche. Kabi Lungtsok is a historic place, located on North Sikkim Highway, 17 km away from Gangtok. 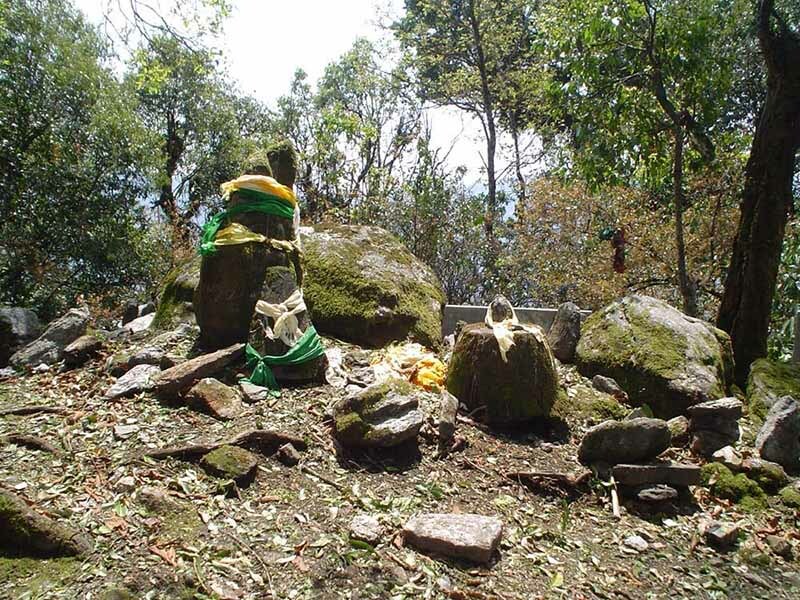 This is the same place where the historic treaty between Lepcha Chief Te-Kung-Tek and the Bhutia Chief Khey-Bum-Sar was signed ritually. From Lhamo Lake, where it’s created, River Teesta flows through the entire state and it has become the lifeline of Sikkim. With exciting rapids spread all over the river’s course, there is plenty of opportunity for rafting in Teesta. Kanchenjunga (8,586 m) is the third-highest mountain on earth. The mountain is venerated as the seat of the Gods. There are many glaciers located in the Khangchendzonga National Park. Animals such as musk deer and snow leopard make their homes here. With a view to die for and housing a huge variety of wildlife, the Singalila National Park is a beautiful place to visit. The highest point of the park is located at 12000 feet and you can trek up to there to enjoy it even more. Dalling Monastery (near Kewzing, South Sikkim). Built in 1840. Dodrul Chorten, Gangtok. Built in 1945-46 with a complete mandala set of Dorji Phurpa (Bajra Kilaya), a set of Ka-gyur holy Books, complete ‘zung'(mantras) and many religious objects. Dubdi Monastery. The first monastery established after the consecration ceremony of the first chogyal. It is situated on a hill above Yuksom and can be approached by trekking only, including a steep slope taking about 35 minutes. Enchey Monastery, Gangtok. A 200-year-old monastery, famous for the mask dance ‘Cham’ performed in January. Karma Kagyu Monastery, Phodong (32 km from Gangtok on the Gangtok Lachung Highway.). Built in 1740, the monastery is famous for its old wall murals. Kewzing Monastery (near Kewzing, South Sikkim). Built during the reign of Chogyal Thutob Namgyal. Labrang Monastery (about 500 meters uphill from Phodang Monastery). Built at the end of the 19th century, this monastery belongs to the Nyingmapa sect. The ruins of Tumlong, the third capital of Sikkim are nearby. Lachen Monastery (North Sikkim). Built in 1806. Lachung Monastery (North Sikkim). Built in 1880. Namchi Monastery (Namchi, South Sikkim). Constructed during the reign of Chogyal Gurmed Namgyal. Pal Zurmang Kagyud Monastery, Lingdum (on the Rumtek – Ranka – Gangtok road, about 45 mins drive from Gangtok). A fine example of Tibetan monastic architecture. Pemayangtse Monastery (Perfect Sublime Lotus) (118 km from Gangtok, 2 km from Pelling and 9 km from Gyalshing). 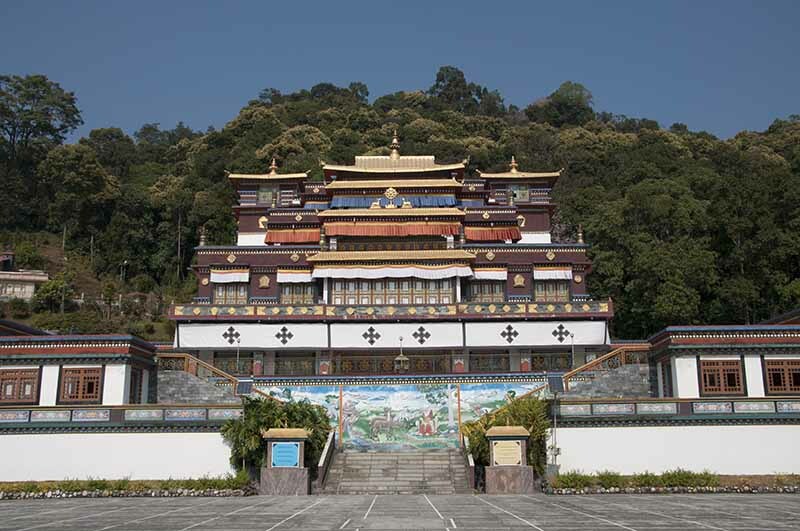 The monastery was founded by Lhatson Champo, the protector of Sikkim. It is one of the most important monasteries in the country. The wooden sculpture on top represents Sang Phok Patri, Guru Rinpoche’s abode in heaven. Phodang Monastery (28 km from Gangtok). Built by the Chogyal Gyurmed Namgyal in the first quarter of the 18th century. It is considered one of the most beautiful monasteries in Sikkim. It has beautiful old mural paintings. Today, about 250 monks live there. Rhenock Monastery (63 km from Gangtok). Sanga Chelling Monastery (about 7 km from Pemayangtse, about 45 minutes walk from Pelling). The name literally means “the island of esoteric teaching.” Built in 1697, it is the second oldest monastery in Sikkim. Sangacholing Monastery. Erected in 1697, it is considered one of the oldest monasteries in Sikkim. It is situated on a steep hilltop and can only be accessed by a 40 min trek through the forest. Tashiding Monastery. It is considered as the holiest monastery in Sikkim. It is situated on a cone-shaped mountain, 19 km south-east of Yoksum. It was erected in 1717. The monastery consists of several stupas (corten), chapels and the main temple. The Nyingmapa-Buddha-Festival is celebrated in the monastery on the 15th day of the first month of the Tibetan moon calendar. Tsuk-La-Khang Monastery, Gangtok (within the premises of the Royal Palace). It was used for royal weddings and coronations. Yangyang Monastery (at Yangyang, 10km downhill from Rabongla). Built in 1840. The agencies also apply for the necessary permits. The prices for treks in the high mountains areas range from US$40 to US$150 per person per day. 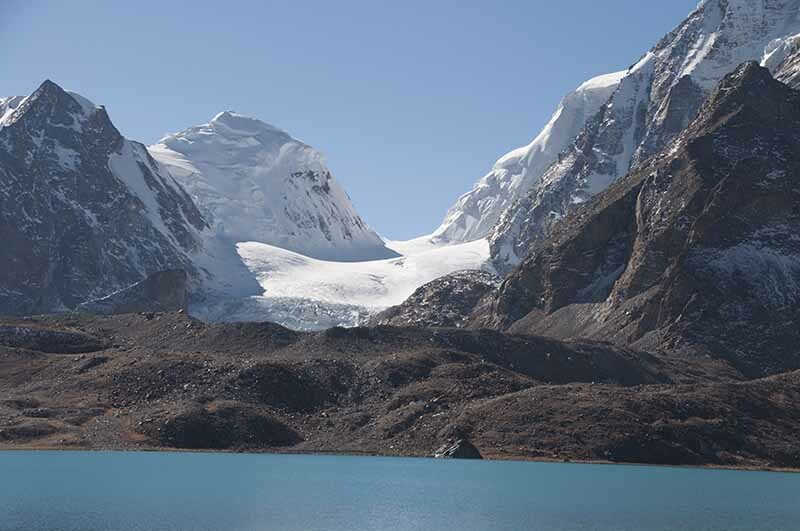 Green Lake Trek — Green Lake is situated at the base camp of Mount Khanchendzonga on the Zemu Glacier in North Sikkim. Green Lake base camp is more than 5,000 meters above sea level. Therefore proper acclimatization is required in order to avoid high altitude sickness. Trekkers must be fully equipped with food, guide, and porters. The best seasons are April and May or October to November. 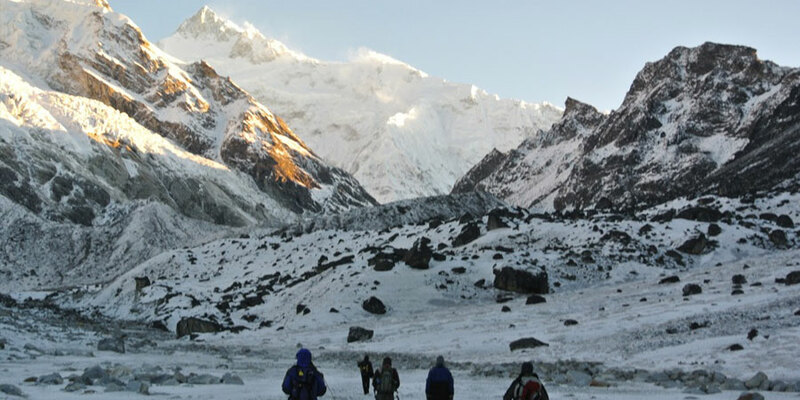 Dzongri trek — The Dzongri trek is suitable for those who wish to go for a short and easy trek. This trek provides a beautiful view of a unique landscape. It starts from Yukso, the former capital of Sikkim, at 5,800 feet, and leads to the point of Dzongri Top at 15,000 feet, right in Kanchenjunga National Park. The best Season is from April to June or October to December. Tholung Trek (North Sikkim) — leads to higher alpine valleys where yaks graze below the snow-capped mountains of the Kanchenjunga range, along with the River Ringpi Chu and to Tholung monastery. Coronation Trek — best season: October to December, itinerary: Rumtek – Sang – Yangyang – Ravang – Tashiding – Yuksom. Khedi Trek — best season: October to December, itinerary: Assam Lingzey – Pashing Teng Kha (Base Camp, 1425m) – Chauri Kharka – Do Bato – Khedi – Sela Pass (3150m) – Do Basto – Tal Kharka – Nubang – Passang Teng Kha. Khangchendzonga Trek — best season: mid-March to mid-June, October to December, itinerary: Yuksom – Bakhim – Tsoka – Dzongri – Thangsing/Bikbari/Kokchorong – Lamuni/Chaurigang – Goechala/Rathong glacier and back. Monastery Trek — best season: March to May, October to December. Pemaiangtse- Sangacholing- Khecheopalri- Dubdi- Hongri- Sinon- Tashiding- Ralong. Rhododendron Trek — best season March to May. Naya Bazaar – Hilley/Soreng – Barsey – Dentam – PeMaiangtse. The official language and lingua franca of Sikkim is Nepali. Many other languages such as Dzongkha and Tibetan are also spoken by smaller numbers. However, Hindi is also widely spoken as a second language, and all educated people are able to speak English. 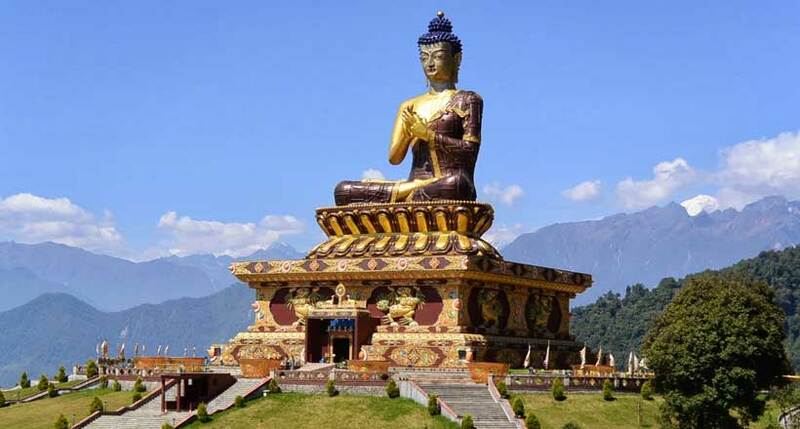 For a long time, Sikkim was a Buddhist kingdom, isolated in the Himalayas, populated by Lepchas and Bhutia, two tribes of Tibetan origin, and governed by the Namgyal Dynasty from Tibet. Sikkim was declared a British protectorate in 1861. The British government encouraged the immigration of Nepalese workers, and today about 75% of the population is Nepalese. Sikkim has a lot of Buddhist influence and they celebrate many of their festivals and events with a lot of enthusiasm. You can enjoy their local dance with music during their festivals like Pang Lhabsol, DrupkaTeshi, Saga Dawa, Kagyat Dance, Losoong, Dasain, Losar. Delicious momos stuffed with meat (also known as ‘Dumpling’). For vegetarians, veg momos are also available along with Thukpas (noodle soup). Phagshapa is a strip of pork fat stewed with radishes and dried chilies. 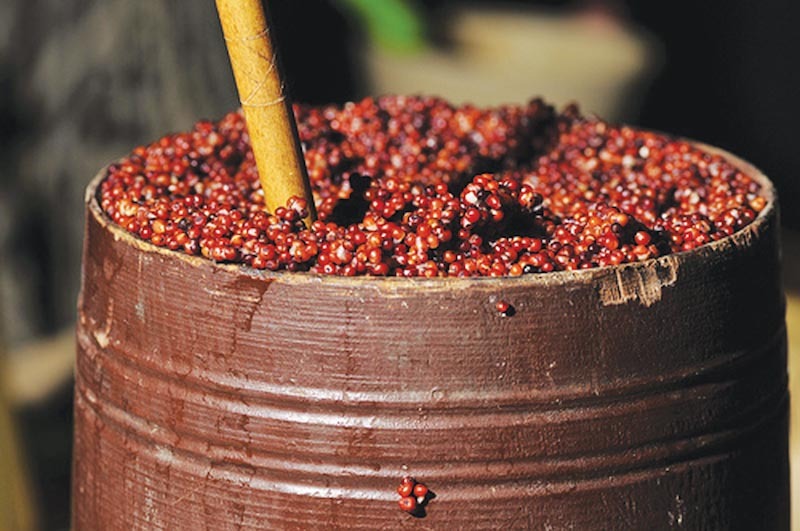 Chhang/ Thumba/ Chee – Locally brewed millet beer, sometimes served in a bamboo glass with a wooden straw. HIT Beer – A local favorite manufactured by a brewery owned by the Bollywood actor Danny Denzongpa. Liquor – Whisky, brandy, rum is very cheap in Sikkim as compared to other parts of India. The way to enter Sikkim from rest of India by its first airport which is situated at Pakyong by taking flight from West Bengal airport or by road using a bus or jeep, or by helicopter from West Bengal. If not Bagdogra airport in West Bengal is the major airport from where you can take a cab to the city of Gangtok which will take around 4 hours. Buses also ply on this route. As of May 2018, it is still necessary to obtain a Restricted Area Permit (also known as Inner Line Permit – ILP) for foreigners to travel in Sikkim. 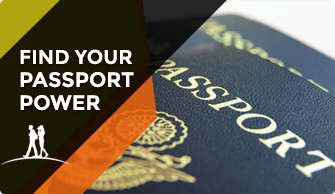 The permit is a piece of paper containing your passport data and dates you are permitted to travel (typically, 15 days). When entering and exiting Sikkim, your passport will be stamped much in the same manner as when crossing national borders. The permit can be obtained when crossing the Sikkim state border by road in Rangpo or Meili. 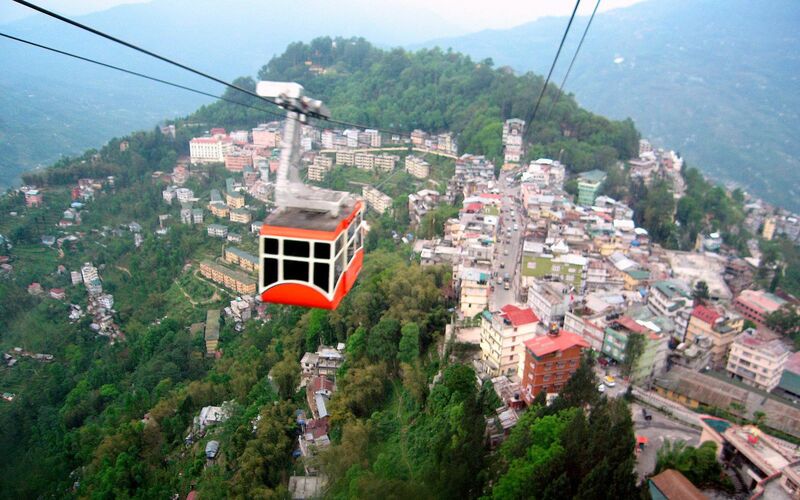 It is also available from Sikkim travel desk in Darjeeling located inside the Old Bellevue Hotel (opposite to Glenary’s restaurant in Chowrasta district), and from Sikkim Tourism Center in Siliguri located at the S.N.T. bus stand, in the vicinity of Siliguri Junction railway station. The website of Ministry of Home Affairs states that permits can also be obtained at large international airports (Delhi, Mumbai, Chennai, Kolkata), but locating the relevant facilities has proven difficult for some travelers, due to the incompetence of personnel. The permit is valid for 2 weeks from the border entry to Sikkim. For the border regions, e.g. Tsomogo Lake in East Sikkim, most parts of North Sikkim and treks into high mountain regions, including Dzongri and Singalila Ridge a Protected Area Permit (PAP) is required. 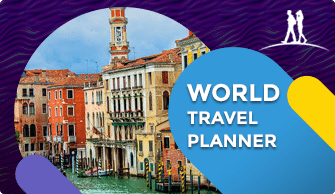 Foreigners must visit these regions in groups of at least 2 persons accompanied by a representative of an officially acknowledged tour operator. The agency will also apply for the Protected Area Permits. Certain regions, e.g. Nathu La in East Sikkim or Gurudongmar Lake in North Sikkim, cannot be visited by foreigners. Sikkim is one of the safest states in India and can be traveled to safely without any concerns. Even during the night, it is safe for people to walk back to their hotels. Cab drivers are friendly and everybody is willing to help.